This web site is intended as a guide (and hopefully to offer encouragement)to those herpetologists with a genuine interest in garter snakes. These most fascinatingsnakes have unfortunately, and undeservedly, earned themselves a reputation as a"trash" or "beginner's" snake, particularly in the USA. Europeanherpetologists have long recognised the worth of garter snakes, and indeed the moreunusual forms of garter snakes are often easier to locate in Europe, particularlyin Germany and Holland. Garter snakes as a genus have the attractive virtuesof being small, hardy, attractive and lively snakes. 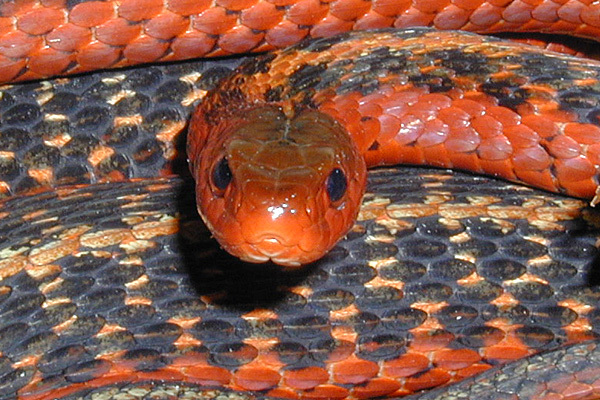 They are generally diurnal,and unlike many of the more colourful snakes commonly kept (such as milk snakes)are usually visible and active during daylight hours. For the most part they aredocile in nature, and will breed easily in captivity, with some species double oreven triple-breeding in a year. The young are live-born and easy to rear.